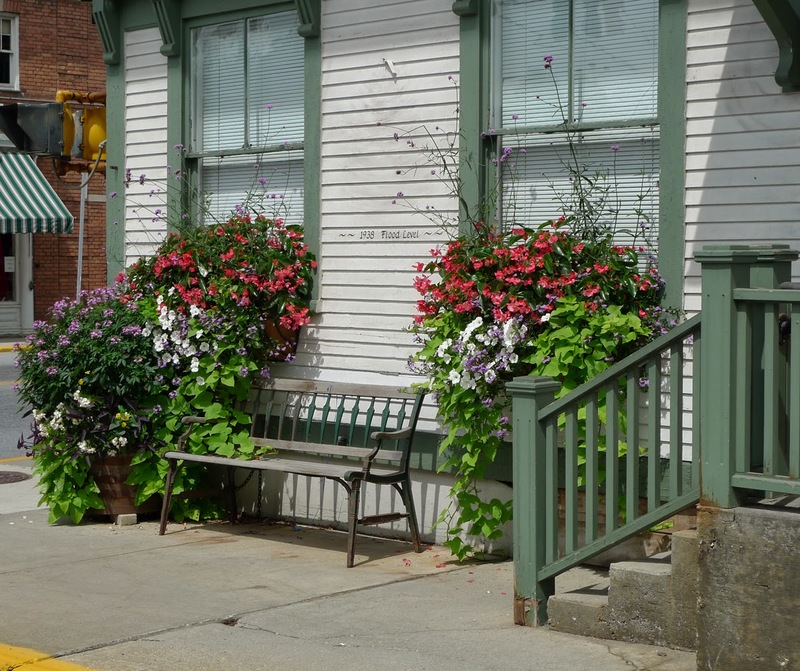 Examples of container gardens in Wilmington, Vt.
WEST HARTFORD, Conn. - A common misconception about container gardening is having to toss the potting mix every few years. But Michael Ruggiero, horticultural expert, has used some of his potting mix for 20 years. "I never throw potting mix out," he told members of the Connecticut Horticultural Society during their May meeting. "Just add a little compost, fertilizer and potting soil. [Then] mix it in with the old." "Buy new plants - don't buy new potting mix," he said. Ruggiero is the former senior curator of horticulture at the New York Botanical Garden and has authored several books, including Annuals with Style. When creating large container gardens, Ruggiero uses empty water bottles on the bottom of his pots to prevent them from becoming too heavy. Next he adds a filtering paper, such as landscape fabric, so the water will flow through, but not the soil. This also prevents the drainage holes from becoming clogged. Ruggiero prefers to use a potting mix without perlite, and never uses garden soil, which can be too dense for container plant roots. "I always buy potting mix that has no fertilizer, than I add 1/4 good compost. I mix it in before I plant." Compost not only adds nutrients to the potting soil, but it holds fertilizer better. He recommended Coast of Maine's lobster compost. Next he adds a granular fertilizer, such as Espoma ("doesn't burn") to the container. He then feeds every two weeks with a liquid fertilizer at half strength. "Fertilize at half strength - it's better to do it less," he said. "If you over fertilize, you can't take it out. Don't try to beat the system." Plants in containers need 70 degrees Fahrenheit soil temperature to be able to absorb the fertilizer nutrients, which in Connecticut happens toward the end of June. "In containers, fertilizer leaches out quickly. Feeding them is very important. I take this seriously." "You have to feed them silly," he said. "They don't have next year. Annuals are sprinters. If you don't give them what they need, they won't grow. You can't feed them enough." While Ruggiero is not a fan of whiskey barrels, unless the plants manage to hide it, he said anything can be used as container to grow plants. "If it's nice and expensive, don't hide it. If it's ugly, hide it." Some containers can be disguised to look more expensive then they really are. One example is a clay-colored Styrofoam container hidden with trailing plants, which can give the illusion of looking like a clay pot. You can plant anything, he said, while showing a photo of a dumpster planted with flowers. Other creative containers include old boots, truck tires, wagons, wheelbarrows - even an extreme example is an old car, as shown in one of Ruggiero's slides. "You can plant [in] anything," he said. Planters - or "coffins" as Ruggiero likes to refer to them due their shape - should have two liners in rotation. In the spring, start planting in one liner with cool weather plants (think pansies and lettuce). The second liner will be the home to warm-season plants that can also be started early on when they are smaller (but out of sight). When it's time to switch to plants that can tolerate warmer temperatures, lift the first liner out and drop in the second liner, already filled with warm-season plants. "You go into mature [plants] immediately," he said, without having to rip out big plants and start with smaller ones again. The first liner can then be prepped for fall planting. Here's an example: start off with tulips amongst other smaller plants. When the tulips are spent, replace with a hydrangea. For the fall, use ornamental grass. In wintertime, put an evergreen shrub in. "You can really do anything you want," said Ruggiero. "If you feed them properly, you won't see that coffin at all." There are so many plant combinations that can be created in containers, that it is possible to never use the same plant twice. Ruggiero even suggested using houseplants outside during the summer. "They are plants that can tolerate your house but do better outside." Another idea is incorporating containers in your garden landscape, not just along paths. "I want color, and I want moveable color ... it becomes artwork in your garden," he said. Another moveable feature are hanging baskets. "Baskets can go anywhere and you can pack them," he said. "I like baskets, but when you buy them, they are so root bound." Ruggiero suggested moving the plants into larger moss-lined baskets which can give the plants more room to grow and better regulate water moisture. Ruggiero even suggested going to the plant nursery frequently and getting a new plant to put in your container to replace one that may be looking past its prime. He stressed that container gardening should evolve with the seasons, not be planted once in spring and left alone. "Planters can evolve from spring to summer to fall," he said. "You should have color all year long. We don't live long enough to have some dips in the action."